There are 67 counties in the U.S. state of Florida. It became a territory of the U.S. in 1821 with two counties complementing the provincial divisions retained as a Spanish territory: Escambia to the west and St. Johns to the east, divided by the Suwannee River. All of the other counties were apportioned from these two original counties. Florida became the 27th U.S. state in 1845, and its last county was created in 1925 with the formation of Gilchrist County from a segment of Alachua County. Florida's counties are subdivisions of the state government. In 1968, counties gained the power to develop their own charters. All but two of Florida's county seats are incorporated municipalities. The exceptions are Crawfordville, county seat of rural Wakulla County, and East Naples, located outside Naples city limits in Collier County. The names of Florida's counties reflect its diverse cultural heritage. Some are named for Confederate political leaders and Spanish explorers, marking the influence of Spanish sovereignty, while others are named for Spanish saints, Native American placenames used by the Spanish, and political leaders of the United States. Natural features of the region, including rivers, lakes, and flora, are also commonly used for county names. Florida has counties named for participants on both sides of Second Seminole War: Miami-Dade County is partially named for Francis L. Dade, a Major in the U.S. Army at the time; Osceola County is named for a Native American resistance leader during the war. Population figures are based on the 2010 United States Census. The population of Florida is 18,801,310, an increase of 17.6% from 2000. The average population of Florida's counties is 280,616; Miami-Dade County is the most populous (2,662,874) and Liberty County is the least (8,365). The average land area is 805 sq mi (2,085 km2). The largest county is Palm Beach County (2,034 sq mi, 5,268 km2) and the smallest is Union County (240 sq mi, 622 km2). The total area of the state is 65,795 sq miles; of this, the land area of the state constitutes 53,927 square miles (139,670 km2) while the water area constitutes 11,868 sq miles. The Federal Information Processing Standard (FIPS) is used by the U.S. government to uniquely identify counties, and is provided for each entry. These codes link to the United States Census Bureau's "quick facts" for each county. Florida's FIPS code of 12 is used to distinguish from counties in other states. For example, Alachua County's unique nationwide identifier is 12001. Fayette County was created in 1832 from the portion of Jackson County east of the Chipola River, with county seat at Ochesee (now in Calhoun County east of Altha). In 1834 it was merged back into Jackson County. 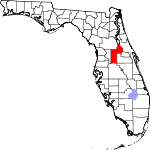 Five counties in Florida have been renamed. Most renamings occurred between 1845 and 1861, during the first sixteen years of Florida's statehood. One occurred in 1997, when Dade County changed its name to Miami-Dade County. Two counties were proposed in Florida's state legislature, but neither actually became counties. A bill was passed by the legislature to create Bloxham County, but residents did not vote to approve it. See Leigh Read County, Florida for the events surrounding the proposed county. Utley, Geo. B. (1908). "Origin of the County Names in Florida". Florida Historical Society Quarterly. 1 (3). pp. 29–35. Retrieved May 25, 2018. ^ "A Guide to Alachua County's History". Alachua County Florida. Archived from the original on October 6, 2006. Retrieved March 24, 2010. ^ "About Florida's Counties". Florida Association of Counties. Archived from the original on October 4, 2012. Retrieved January 20, 2010. ^ a b c d e f g h i j "Florida County Maps". Florida Center for Instructional Technology – University of South Florida. Retrieved January 16, 2010. ^ a b "United States Environmental Protection Agency (EPA) County FIPS Code Listing". United States Environmental Protection Agency. Archived from the original on October 8, 2012. Retrieved April 24, 2008. ^ a b "NACo – Find a county". National Association of Counties. Archived from the original on October 25, 2007. Retrieved April 24, 2008. ^ "Florida QuickFacts from the US Census Bureau". United States Census Bureau. Archived from the original on August 14, 2012. Retrieved August 19, 2012. ^ "An Act to organise a county to be called the County of Fayette". Act No. 53 of 1832. ^ "An Act, more accurately to define the boundaries of Fayette County, and for other purposes". Act No. 31 (Chapter 688) of 1833. ^ "An Act to repeal certain acts organizing the County of Fayette". Act No. 26 (Chapter 765) of 1834. ^ "An Act Providing for the Creation of Bloxham County in the State of Florida, and for the Organization and the Government Thereof". Act No. 130 (Chapter 6936) of 1915. ^ "An Act Providing the Manner, Method and Means of the Election and Creation of a Charter Board in the Territory now Comprising Dade County; Providing for the Drafting and Adopting of the Charter Prepared by Said Board for Said Territory; Providing for the Election of Commissioners of a New Political Subdivision in the Territory now Comprising Dade County to be Known as the County of Miami; Providing the Effective Date of Said Charter and the Time the Board of Commissioners Shall Take Office; and Providing that This Act Shall not Become Effective Until the Joint Resolution No. 407 has Been Approved by the Qualified Electors of Dade County and of the State of Florida as a Whole". Act No. 853 (Chapter 24467) of 1947. Atlas of Florida, revised edition. Edward A. Fernald & Elizabeth D. Purdum, editors (University Press of Florida, 1996). "Evolution of Counties", pp. 98–99.